In Parts I & II of this series on the history behind the movie, I talked about several major historical events of the times and a couple of my favorite anecdotes that made it into the film. In Part III, I’ll look at the major characters, how they were portrayed in the film and what we know about their real lives. Because I’ve written so extensively about Hypatia (essays, guest blogs, and a novel,) I’ll save her for last. In the first part of the movie, ORESTES (Oscar Isaac) is a pagan student of Hypatia’s, the ardent admirer who woos her, and becomes the recipient of the bloody handkerchief. Since we know almost nothing about the historical Orestes, those things could have happened, but it’s extremely unlikely. We do know the names of several of Hypatia’s students who became leaders in the Church and government and Orestes is not among them. I’ll chalk it up to “artistic license.” In the second half, he has converted to Christianity, been appointed Prefect of Alexandria, and seeks Hypatia’s advice on several matters. They are comfortable friends. Socrates Scholasticus tells us that Orestes was a Christian baptized in Constantinople by the Patriarch Atticus shortly before he took up his post in Alexandria. Whether he was a “convenient” Christian (baptized in order to move ahead in politics) is unknown. His actions indicated he was tolerant of pagans and Jews. He included them in his circle of advisors, which infuriated Bishop Cyril. Cyril supporters spread rumors in the city that Hypatia held sway over Orestes and he “ceased to attend church, as had been his wont.” A group of monks from Nitria stoned Orestes in the street and nearly killed him. He was rescued by Alexandrian citizens who also apprehended the leader of the monks—AMMONIUS (Ashraf Barhom). Ammonius was executed for his attack on Orestes. Bishop Cyril tried to make a martyr of him, but the Christian elite balked, saying Ammonius got what he deserved for attacking a duly appointed Imperial governor. After Hypatia’s death, a short time later, Orestes disappears from the record. SYNESIUS (Rupert Evans) of Cyrene also shows up as a student of Hypatia’s in the first part of the movie. He and Hypatia’s other Christian students shelter with her in the Serapeum, then escape in the night, before the destruction; but not before a tender scene in which Synesius bids good-by to “my mother, sister, teacher” and kisses the sleeping Hypatia’s hair. Synesius returns in the second half of the movie as the “Bishop of Cyrene” to negotiate between Orestes and Cyril. He repudiates Hypatia and accuses her of heresy because she is studying whether the earth circles the sun or vice versa. When she refuses to convert, he turns his back on her and leaves her to her fate. “I am dictating this letter to you from my bed, but may you receive it in good health, mother, sister, teacher, and withal benefactress, and whatsoever is honored in name and deed. For me bodily weakness has followed in the wake of mental sufferings. The remembrance of my departed children is consuming my forces, little by little. Only so long should Synesius have lived as he was still without experience of the evils of life. It is as if a torrent long pent up had burst upon me in full volume, and as if the sweetness of life had vanished. May I either cease to live, or cease to think of the tomb of my sons! The all-round bad guy in the second part of the movie, CYRIL (Sami Samir) led the mob that attacked and murdered the Jews of Alexandria, humiliated Orestes, and urged his supporters to murder the “witch” Hypatia. To a large extent this reputation is deserved. The former Bishop Theophilus was Cyril’s uncle and oversaw his religious education sending him to study with the fanatical monks of Nitria for five years. When he returned to Alexandria, Theophilus enrolled him as a cleric and personal attendant, but Cyril only reached the lowly level of “reader” in the church before his uncle died. During the contest for the Bishopric against the popular Archdeacon Timothy, Cyril called on the monks of Nitria. They invaded Alexandria and rioted until he was elected. Among historians he is castigated for his persecution of the Novatian Christians and his leadership in the attack on the Jews and the Nitrian attack on Orestes. Although there is no direct evidence that Cyril ordered the assassination of Hypatia, he is held accountable by the writers of the times. In his later career, Cyril was embroiled in controversy with Nestorius, the Bishop of Constantinople over the nature of Christ and was accused of bribing those close to the emperor to get his way. He certainly used mob power to take over the Council of Ephesus in 431, which Theodosius II ordered to settle the matter. But in the Church he is best known for his writing and scholarship on doctrine. That is what earned him his sainthood. Neo-Platonists believed a person could know the transcendent One (God) from which the rest of the universe emanated, but not through logic or reason—only through deep meditation to achieve an ecstatic state. Before one could reach that state, she/he had to demonstrate levels of virtue. First, one lives an ethical life and exhibits civic virtues, but this does not elevate the soul. On the second level, one attains purifying virtues and frees oneself from sensuality and all things of the flesh. The last stage is reached through a total loss of self. Then a person may see God. In that moment a person enjoys the highest indescribable bliss, bathed in the light of eternity. Porphyry says Plotinus attained this ecstatic union with God four times during their six years together. Hypatia led a small group of her most intimate students through the processes by which they could attain this ecstatic state. They seemed to study everything that enhanced their openness to all things divine. Her methods were never revealed by her students, but from their writings, she didn’t seem to engage in cultic experiences, but may have engaged in reciting prayers or hymns. One scholar believes Synesius’ Hymns V and IX were composed during his time studying with Hypatia. So, Amenábar got it wrong. Hypatia believed in more that math and science. Although she was not Christian, she was not a “pagan” in the sense she did not worship multiple gods or engage in cultic practices. Nor was she an atheist who believed only in science. Hypatia was a deeply spiritual woman. She was the beloved Lady Philosopher of Alexandria. Dzielska, Maria. Hypatia of Alexandria (Harvard University Press, Cambridge, Massachusetts, 1995) Translated by F. Lyon. Thank you. I now have a much greater appreciation for the movie Agora after reading your blogs about the historical accuracies and inaccuracies. Perhaps Amnibar simply tried to do too much and had he narrowed the scope of his movie, he could have told a tighter tale. Or this material would have been better suited to something more epic like a mini-series…or perhaps an HBO series after the likes of Rome. I especially appreciate your entry about what really happened to the great library at Alexandria. Like most, I assumed that the burning of the library was an “event” that ushered in the Dark Ages. I even think that my comp lit professor cited a date for it back in college–a date without explanation. Knowing that it was situated in the royal complex alone changes the way that I think of it in time. I was unaware of the controversy surrounding Agora, but it makes sense since anything that portrays the Christians and especially the Catholic Church negatively is a beacon for criticism. Still, I find the film very flawed. The story goes in too many directions and other than Hypatia an audience member does not know where to invest himself/herself. I’d love to see this movie re-cut and at least 1/2 hour shorter, it might go from alright to fabulous. Thanks for the post, Rachel. Sorry about the delay in getting back to you. I agree, that the material in Agora deserves a much longer format to get all the nuances. I loved HBO’s Rome. With all its inaccuracies in relationships and compressed timelines, it still gave a wonderful portrayal of pre-Imperial Rome–the Rome of timber and brick, twisty alleys, pre-mafia “collegia,” and household gods. We get just a glimpse of Alexandria the city in Amenabar’s film. In spite of the title Agora we didn’t even see much of it. I was hungry for more. But movies are finite and he had to make some artistic choices. As to the “Great Library” I also grew up thinking it had gone up in flames (vaguely “back then.”) It’s fun (and a little sad) as an adult dong my own research and realizing how my teachers and text books got it wrong. Again, how does a committee chose what to teach a class in the brief time they have? Whatever’s on the standardized test. No time or room for nuance or depth. And most of all, thank you so much for the plug on your blog! Thanks for the comments, rizki! I’m afraid as a child, I was known as “The Little Professor.” I try to make history accessible through my posts and novels and it’s very helpful to hear that I’m succeeding! Wonderful articles. Thank you for providing so much great historical context and illuminating where the movie took creative license. WOW!!! Interesting!!! I love history and reading your posts just make me wanna know more!!! Absurd. Not only that Synesius would repudiate his revered spirit guide; not only that it was never a heresy; but that Hypatia and her father edited the definitive edition of Ptolemy’s “Almagest.” She was a commentator on her Alexandrian predecessors, including Ptolemy. There was no reason to suppose the world was arranged other than what the senses revealed. Furthermore, unlike the Aristotelians, the Platonists were not into the natural world. They were more into the world of Forms, as a stepping-stone to the divine. Mathematics is pure form, and astronomy was a branch of mathematics, not of the Physics. That is, neither Ptolemy nor anyone else supposed that his epicycles and descants and deferants were physically real. Astronomy was simply the math used to compute the positions of stars and planets. It was not a study of the natural world. That the earth circled the sun had been decisively falsified by Aristotle and Archimedes. The Pythagorean notion that since the sun was fire and fire was nobler than earth, that the fire should go in the center because the center was nobler than the edge could be called many things, but “science” is not one of them. Actually, it is usually swallowed whole and modern and post-modern heads nod wisely and unskeptically. And never mind that the Patriarch of Rome had nothing to do with the events in the movie. It was solely and entirely a matter of the Patriarchate of Alexandria. At most, you might say the movie attacks the Eastern Orthodox Church; but when you realize that Cyril is most highly revered by the Monophysites, it is more an attack on the Coptic Church. I really liked the film, despite its flaws, and was saddened that it saw such a brief showing here. I was doing some research on its historical accuracy and came across your site. Thanks so much for sharing your knowledge in this area. But I am still not sure of Hypathia’s beliefs. Firstly, neo-Platonism may have absorbed bits of Aristotle but it’s hard to see how his critique of the theory of Idea in Metaphysics went into this. Anyone who’d read that would be scepticial of the identity of the Ideas-Forms etc with god, and there is plenty of evdience to suggest that true neo-Platonists were more likely to be, say, Gnostics, rather than ‘philosophers’. Secondly you seem to be describing some Stoic ideas of virtue in the mix as well. This further suggests a distance from late neo-Platonism. I persist in seeing the late ancient world attachment to ‘philosphy’ as atheist in a sense that we no longer have: a-theist, not believing in ‘a’ god. In that sense Hypathia may have been like Lucretius, a seeker after metaphysical (or ontological) truths surely, but not . All of these comments are of course open to question. I appreciate your writings nevertheless. Thanks for the comments, Andrew. I don’t think anyone truly knows Hypatia’s beliefs. None of her writings on philosophy have survived. There are some notes on mathematical texts that are attributed to her, but all biographers and historians can do is look at writings from contemporary writers and extrapolate. I’ve never studied the philosophers in depth – I’ve concentrated on politics, economics, and roles of women in society in my historical studies – so thanks for your thoughts on what might be the source of her beliefs. Your analysis that she may have been “a-theist in not believing in ‘a’ god” may very well be correct. In many of the movie reviews and comments on other blogs (both Christian and atheist) there seemed to be a lot of condemnation/celebration (depending on the context) of her “atheism.” I was trying to moderate that extremism with information that suggested that Hypatia was not an atheist in the modern sense of denying the existence of “God” and believing only in math and science; but through her dedication to philosophy (as it was taught then) most likely had some beliefs in a creative force/transcendent One. As to how math was used in philosophy to reach some ecstatic state – I have no idea! Maybe it had no role. Synesius refers to “divine geometry,” but that might have been hyperbole. Perhaps some other readers can point us in the right direction. Thanks for all this historical background, the three Hypatia articles are quite fascinating. I have not read as deeply on the time or on Hypatia, but I did look forward to and attended the film AGORA because I’d read Dzielska’s “Hypatia of Alexandria.” I hope I reviewed it as an interesting but ultimately unsuccessful film. Thank you for your comment on my blog, and for leading me to yours. Fascinating stuff, I’ll be following. Thanks for the comments, Molly! I thought your review was insightful. Dzielska’s book is my favorite source on Hypatia. Michael Deakin also has a biography Hypatia of Alexandria: Mathematician and Martyr which I have yet to read. I wrote my novel several years ago and have moved on to other projects and research. Thanks for the posts Faith! I found the movie fascinating as well, and was moved to pick up the book you mentioned, “Hypatia of Alexandria: Mathematician and Martyr”. I was curious about what Hypatia had actually achieved in mathematics. The author, Michael Deakin, is a retired math prof from Monash U. near Melbourne, Australia. http://babelniche.wordpress.com/2010/09/28/more-on-agora-and-hypatia/, but in brief, she was the world’s leading mathematician in 400 CE after the death of her father, but that happened to be a bad time for math in general. The most direct thing we can assign to her is a new method for doing long division in the base-60 positional notation used by the Greeks. That was actually an important advance, but nowhere near the epiphany that she’s given in the film. She was certainly an important figure, but in my opinon what’s portrayed in the film wouldn’t have been possible for anyone in the classical world. on July 26, 2010 at 3:00 pm | Reply Julie Buz. Faith, I am SO thrilled that I discovered you! Thank you so much for stopping by my blog and leaving a trail as I immensely enjoyed these three posts that you wrote about the film vs. history. What I found most amusing was that Davus didn’t really exist – he was the one character I completely failed to understand throughout the film (what moved him, what were his motives, it just didn’t make sense to me, but perhaps I’m just a dimwit). You seem to be writing about a part of history that I enjoy (although I’m not a particular fan of history per se – rather of art history), so I think I’ll stick around! Thank you once again… I have a feeling this is one of those encounters that are just… miraculous! Hi Julie! So glad you like the site and thanks so much for the link on your own blog. Davus was a strange character in the movie. He was a household slave, but given Hypatia’s dedication to modesty (in spite of the bloody rag incident) I really don’t think she would have had him as a “body” servant attending her in the bath. He seems to have been more of an artistic device than a fully realized character. As to the 5C – it’s a fascinating time in history as the Church comes into its own and the Western Roman Empire crumbles under constant barbarian assaults. Lots of change, lots of chaos, lots of historical stories and fascinating people for a historical fiction writer to mine. Enjoy! Hi Faith, visiting here from Lucky Atheist (thanks for your visit over there.) I haven’t seen the movie yet but once I do I’ll come back here to compare against the historical record. The early church has always fascinated me, not least because there was at that time the possibility that Christianity would look very different today than it does; a lot of the sects were the Betamaxes and Edsels of Christian denominations. There are some cool alternative history novels waiting to be written, to explore why things happened the way they did. How about an Arianist Crusade? A Marcionite Charlemagne? Hi Michael, thanks for dropping by. I’ve done a lot of reading on the early Christian church as research for my novels. It’s amazing how many sects there were and the various beliefs they held. Certainly gives the lie to “the one true church.” I hope you enjoy the film! Excellent post. I found Agora somewhat disappointing, mainly due to Hypatia’s characterization as an atheist scientist instead of as a Neoplatonist. And the movie didn’t seem to be so controversial to me – Christians as villains opressing elightened scientific pioneers, humanists or “plain nice folks who just want to live their lives like us”? Hollywood does that all the time. To be fair, though, in the movie Pagans, Christians and Jews are capable of stupid, bigoted and violent acts. And the reconstruction of Alexandria is exquisite. Again, thanks for the great posts – I learned a lot about Hypatia and her times here. Fantastic article on the actual history vs. the film. In the end I loved the movie, and having recently started looking at flims set throughout the era of the Roman Empire, it seems a shame that there are so few set after the third century. A real treat – thanks! Fantastic! Well-written, informative and damned interesting. I stumbled upon this entry because Agora is in a theater in my area. Sorry to break it to you, but your review / critique made me want to see the film more. Great! I’ve been very disappointed in the lack of distribution of Agora. I’m hoping the movie is a blockbuster and Rachael Weisz wins an Oscar for her portrayal of Hypatia. 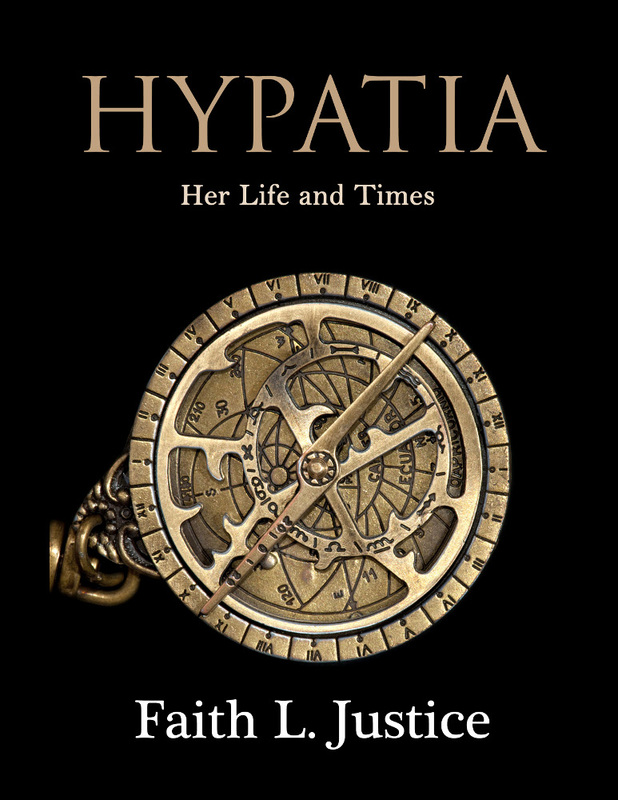 The more folks interested in Hypatia, the more likely they are to stumble onto my novel. Amenabar took some liberties with the historical facts, but that’s what artist’s do. I’ve never gone to a fictional film for accurate history or science. But, as I said in the intro to Part I, this series of posts is not a movie review or critique of the film as a piece of art. I used the film as a framework to tell Hypatia’s story to the best of my ability and knowledge. So go to the movie, enjoy and spread the word to lots of people! Hey, thanks for your comment on my blog previously. I am really grateful that you explained the details about Hypathia’s life. I was confused about the mixed-up plot on the movie. I’m really excited about movies especially history movies. And I always get disappointed whenever i try to find the details on smart website like wikipedia. I was wondering if Davus was a real character, and also about the accusation to Hypathia from Cyril, i was wondering about the motive, was it because of the ‘witchcraft’ or else. You’re welcome, tria. Glad I could help unmuddy the waters! Thanks for collecting the historical background, seems reasonable and balanced. What I loved most, though, was the link back to the letters of Synesius – epistemology recapitulates philosophy! Thank you so much for your articles, just got to see the movie Agora. It was beautiful and brilliantly done, if not perfect. I’ve been fascinated by Hypatia for years, but never expected the story to be made into a movie, let alone come to Santa Rosa movie theater. Been waiting impatiently for Yousef Zeidan’s novel Azazil to come out in English since hearing about it last year, so Agora was wonderful to be able to see. Thank you. So glad you enjoyed the posts, Maire! I hadn’t heard about the Zeidan novel, but looked into it after your post. It, indeed, looks interesting. I’ll keep my eye out for it. hi, wow, thanks for the great posts on a film i rather enjoyed. onto my question: not having more than basic knowledge of neo-platonism, could you recommend a recent text that might well treat the subject? and if you’re rained in one summer day, you might do a list of what you consider to be the more interesting recent historical films. Thanks for the comments, David! I have to admit I haven’t studied neo-platonism much beyond a surface level. I’ll check and see if I can come up with some reputable sources. As to the list of recent historical films–I’ll give that some thought! Thank you for your excellent analysis of the movie and how it portrayed 4th/5th century Alexandria. As a member of the Coptic Church, I sometimes find myself in the position of having to explain to people who the Copts are (yes, there are Christians in Egypt! ), the place of the Coptic Church in history (particularly the period of heresies and church councils during the 4th & 5th centuries), and how Copts are persecuted in Egypt by Muslims today. I was quite surprised to find out that a movie was being made about the events surrounding the transition from paganism to Christianity in Egypt during late antiquity. In the Coptic Church, Cyril is indeed considered a great saint, but I think very few Copts are actually aware of his role in the violent events of the time. Most know him only for his role in the Council of Ephesus where he refuted Nestorianism. I actually stumbled on the story of Hypatia when I was in high school by accident while reading Carl Sagan’s book Cosmos which mentions it briefly. I think the movie portrays the change from paganism to Christianity relatively fairly, since there certainly were Christian fanatics in Alexandria during that time. What I find a bit unfair however, is the oversimplification of the political climate, which you admirably mentioned. If anybody comes away from this movie thinking that the Coptic Church, or Egyptian Christians are fanatical, bloodthirsty people, this could not be further from the truth! Copts today are some of the most peaceful people on Earth, having suffered persecution and death for our faith for almost the entire period of time since Christianity was first introduced to Alexandria in the first century. It is unfortunate and sad that during the one period when we were not persecuted, during the fourth century and first half of the 5th century, we engaged in behavior almost as violent and intolerant as we experienced. But as Christ Himself advised, render unto Caesar what is Caesar’s, render unto God what is God’s. When members of the Church of Alexandria committed evil, whether a lowly monk or the Patriarch himself, it was usually due to involvement in political affairs. Plotinus recommended the study of mathematics and dialectics (that is, philosophical reasoning) as a way to purify the mind, to learn to think dispassionately, which serves the purpose of acquiring detachment (from worldly urges and such). So such study might be understood as a prerequisite to being open to ecstacy, not a direct means. Faith, the links to Parts I and II aren’t working for me. And I’d love to read them. I chuckled when I looked at your selected bibliography. I used all those books for an undergraduate paper I wrote on pagan survivals in Alexandria after Hypatia’s death. Alexandria in late antiquity is a fascinating topic all on its own. Haven’t seen the film, but trailers indicate it won’t be as wonderful as the Alexandria I built up in my head from reading the sources. Far too much detail for a mere 2-some hour biopic. Thanks for the comments, Michal. Alexandria is a fascinating city. I was thinking just this morning, that I needed to do a post or two on it! I had a question you might know the answer to. I’ve found these four quotes attributed to Hypatia on several sites, but I haven’t been able to find a source for them. I was under the impression that almost all of her writing is lost, and the quotes seem a little convenient (even if they match my own viewpoint), so I’m a bit suspicious of their authenticity. Thanks for your comments, chuko! I’m afraid I can’t answer your question definitively. I’ve also seen these quotes attributed to Hypatia and am highly skeptical. Everything I’ve read says that none of her philosophical writings survived. There is some evidence that she contributed commentaries to a handful of math texts, but these are explanations and examples used to explain the math theses to students, not philosophical statements. Professor Michael A. B. Deakin from Monash University has a biography Hypatia of Alexandria: Mathematician and Martyr and posted a list of primary sources on Hypatia’s life. He doesn’t mention any quotes. I suspect these statements are sourced from the myriad plays, poems and fiction books about Hypatia and are the authors’ creations. One of these days, when I have some extra time, I might try to run them down. The internet is a great place, but so much stuff is poorly sourced and unquestioned. Over ten years ago, I posted a beautiful picture of a Fayum mummy portrait from The Mysterious Fayum Portraits: Faces from Ancient Egypt to illustrate an essay I did on Hypatia. I got permission to use the picture, credited it in the caption and in no way said this was a picture of Hypatia. Google “images Hypatia” today and that image is the first one up. Go to the images page and you find that picture all over the internet (I counted over 20 before giving up.) Only two of the sites that posted the image credited it as a Fayum portrait, but both said it was of Hypatia (who lived 200 years later.) As I said in my post on doing historical research, the problem with the internet is quantity and quality–too much of the former and not enough of the latter. Thanks for your insight into the spiritual side of Hypatia and the difference between ancient and contemporary philosphy. Excellent. Thanks for your articles giving more background to Agora the movie I saw yesterday. I can’t stop thinking about it….. I had to aearxh foe more information. This in itself makes it an artistic success, which deserves our acclaim and promotion. Yes, Oscars all round, please! The tragedy, despite possibly (probably definitely) the many inaccuracies of historical details in the film, is that nothing has changed in life and politics. We seem to be at the brink of a new ‘dark age.’ This is the tragedy that we have to recognise and work hard to improve. I left the cinema chanting to myself ‘Knowledge, love and tolerance are the only things that can help us treat eachother well and fairly. Disagreement about facts or interpretations (and overt slipping things into scriptures or histories, that become ‘facts’), which humans develop into arguments, hatreds, Insults and other destructive forces must not ‘turn us into vicious murderers.’ We are all brothers AND Sisters. Our struggles to understand our world and heavens must not lead us to destroy eachother. Religion: politics of the past and unfortunately of the present despite the best efforts of democratic secular cultures remains a divisive force in the world, which I guess we don’t need reminding of, but we do need reminding that only with knowledge, thought acceptance and tolerance can we attempt to get ourselves out of this violent mess. The film is completely successful as an artistic device to show an interpretation of something and to attract or demand thought and hunger to understand better AND after a personal enlightenment hopefully contribute to our human evolution to make the world a better place. Through our various religions and various moral codes we humans have attempted to evolve positively and thankfully the rebirth of scientific enqiury and education for all (in most cultures) is helping us evolve as better, ‘humane’ humans. There are countless ‘good news’ stories and histories of love, help, kindness…. But the overall evolution is TOO SLOW. It’s still, it seems one step forward then a couple back. poetic license or interpretations he too made to get there. Thanks for your comments! I agree, that from an artistic sense, Agora did a great job of inspiring thought and discussion about important issues. I have a Google Alert on Agora and have read hundreds of articles and blogs since the movie came out. Condemnation of the movie runs strong at the extremes (which you would expect) with a large contingent calling for tolerance. Given your clear call for knowledge, love and tolerance, I’m assuming your last question is rhetorical. But for any readers who don’t know, “agora” is the Greek word for an open physical space where people gathered to trade, conduct politics, discuss news, loiter, and (in much earlier days) watch plays or sports contests. It was the mercantile, political and social center of the city. My guess is that Amenabar named his film Agora as a metaphor representing the discussion of ideas he hoped to spark. Thank you so very much, Faith, for your fabulous 3-part blog here! You have put so much work into this for our benefit! I have not seen the film yet, as I was worried about the amount/lack of historical content (films rarely portray Truth, even though Truth is far more fascinating than fiction!). I feel I can see the film now (on DVD), with your expose to guide me around the dodgy bits! And I look forward to reading your novel. I am an astrologer, and research history through the thousands of asteroids available to us now as the body-text of the chart. Hypatia is one of them!, along with Orestes, Plato, Aristotelese, Plotinos, Ptolemaeus, Ptolemy, etc. They pinpoint past-life locations and times in history, and also experiences/beliefs in the psyche. Hypatia must surely be strong in your own chart. Thank you for bringing her safely back to life for us! Thanks, Kerrie! I knew Hypatia was an asteroid, but have never checked out a picture. I’ll have to look. Hypatia has also been honored with a philosophy magazine, font, a lake and many cats! Gotta love Google Alerts. Thank you for these posts. Very informative, and helps me to put things in perspective. Hi Faith, There is a tendency for “neat” quotes from obsure people to get “fathered” on to more famous people. A famous example is a quip made by a member of a state lelislature in the mid 1850s “The only good Indian is a dead Indian”. Many years later this statement was attributed to General Phil Sheridan. When the general was asked about it he exploded in anger saying not only that he never said such a thing but that it was one of the dumbest things he had ever heard and that who ever had said it was a damn fool. Yet, whenver the name of General Sheridan comes up one of the first things you read is that he said this. It even turns up in the history books! It all started with Thales. Only two of his sayings have come down to us yet there is a large number of “quotes” attributed to him. On the strength of one them he was counted among the seven sages of ancient Greece. It would seem that the things we never say are far often more important than the things we do!